Violet Rose Jack came into our lives on July 5, 2010. At that time, we didn't know if Jack was a Jack or Violet was a Violet, so our 8 year-old naturalist decided to call it Jack-Violet. J-V (for short) was a very small caterpillar living in a clear plastic cup with a coffee filter lid and milkweed leaves for sustenance. YuYu loved this caterpillar from day one. Every morning she would check on J-V and make sure s/he had a new leaf. She even cleaned out the caterpillar poop (a new one for me - I never knew caterpillars could poop so much)!. Every night before she went to bed, there had to be one last look at J-V to make sure s/he was comfortable. There were also the various checks during the day. One evening when I was out, I called home and was greeted with, "Good news! Good news!! J-V has crawled to the top and is now in a 'J', so the chrysalis is next!!" She wanted to set up the video camera to make sure we didn't miss a step of the journey of Jack-Violet. That didn't happen, and sure enough, the next morning there was a bright green chrysalis attached to the coffee filter. It was made clear to me that Mom should have listened to the 8 yr. old naturalist. I'll forever be guilty of missing the filming of J-V turning into a chrysalis. It's a guilt I'll just have to bear. Repeated checking of the plastic cup and coffee filter showed the bright green chrysalis hanging on. We left well enough alone and didn't touch the filter or the half-eaten leaf in the cup. Didn't want to disturb our lovely J-V when s/he was working her or his hardest! Impatience growing, repeated requests for the movie camera to be set up when the chrysalis turned dark, repeated checking. Fast forward to last Sunday, 7/18. Mom trying to pull herself together to get out the door to the Woodstock Folk Festival. "IT'S DARK!!!!!!" comes the yell. The chrysalis had gone dark, which was the clue that s/he would be emerging soon. The paper said it would happen the day before s/he emerged. So there was plenty of time to set up the movie camera, right mom?? Well, it wasn't going to happen, but I grabbed my camera and we started snapping some pictures to capture the moment. As we sat there, staring at this dark little blob attached to a white coffee-filter, excited by what was to come the next day, little naturalist started jumping up and down. "It's moving!!!!!!" "It's cracking!!!" And there it was. This UGLY little black blob poking its way out of its shell. I couldn't imagine for the life of me how this misshapen thing was going to turn into a beautiful, full-winged monarch butterfly. Well, this took precedence over everything. Of course I had to get to a festival, of course I had some errands to do, of course I needed to take a shower to be presentable in public, but all that was lost to the moment. There was a butterfly being born and an 8 yr. old whose eyes were shining brighter than I've ever seen before in all her short life. We sat and watched J-V as s/he stretched out her wings to change from a black blob into a magnificent monarch. It's then that YuYu could confidently exclaim, "It's a Violet!" As to how she knew it was a female monarch, I give all credit and honor to second grade teacher Mrs. Bebber. We are forever in your debt. We sat and watched as she started to spread her wings. But, as often happens in life, there was an obstruction. The leaf. Over the last ten days it had gone from a supple milkweed leaf giving sustenance to an ever-growing caterpillar to a dried, autumnal, immobile, miniature monolith, not giving in to the insistence of the fairy-light wings of the newborn monarch. The flapping of Violet's wings grew less and less. We started to worry that our desire to not intrude upon the sleeping J-V would be the death-knell of Violet. Butterflies need to spread their wings and flap or the wings will stick together and they won't be able to fly. And they'll die. The instructions on our caterpillar-to-butterfly paper said that after the wings had dried, it should be moved to a flowering plant within six hours so it can start to feed. We were unprepared. Being the incredibly inept gardener that I am, I had no flowering plants at all in the yard. Off to the store where nature-girl picked out a simple daisy plant. Also were some frank discussions about the cycle of life, how sometimes, even with our best efforts, our loved ones do not survive, and how we will do everything we can to make sure Violet can go free. Stoically, she walked through the Dominick's with her plant, determined to do her best by her pet. By the way, the naming of Violet Rose Jack was explained to me thusly, "Violet, because she was always Violet; Rose - because it's my middle name; and Jack, a good last name if there ever was one." Daisy purchased, plastic cup and the not-yet wing flapping bug in hand, we were off to the outside deck to see if we could save Violet. The ever-so-careful transfer of a new-born butterfly from coffee filter to daisy. The silence. The waiting. And flap she did. She flapped, she grew more sure of herself, and then she flew, up into the tree. A brisk wind came along and she held on. What a strong butterfly she is! 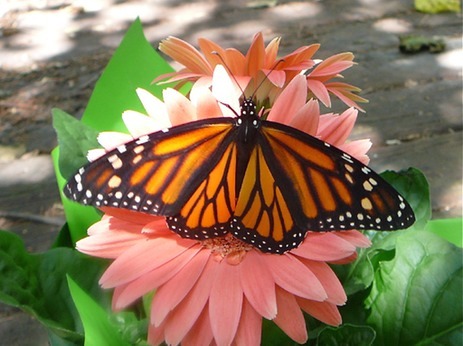 And as the wind died down, the shining-eyed 8 yr. old bade good-bye to her beloved Violet as she headed off to start her life as a full-fledged, incredibly beautiful, forever loved monarch butterfly. And I got to witness it all. The miraculous birth of a butterfly, which in my fifty years I had never beheld, and the incredible wonder, determination and love for a bug by an 8 yr. old. It still brings tears to my eyes. It was an honor, a privilege, and a mystery to have shared. I have been blessed.